America's Choice Insurance Partners works with multiple carriers to get its clients the very best rates on home owners insurance. They can help personalize your coverage so it fits with your needs, your lifestyle and your budget. Learn more about home owners insurance from ACIP. ACIP features unique and modern coverage no matter what kind of car you drive. They can tailor a quote to fit your needs whether you are brand-new to the road or an experienced driver. Just like with its other insurance products, America's Choice Insurance Partners deals with multiple companies so you get the best deal possible. We were born in the RV industry so we know what RVers need. ACIP has an in-depth knowledge of the insurance products available for all kinds of recreational vehicles. We also know that coverage for your motor home, travel trailer, fifth wheel or camper needs to be tailored to fit your needs. Talk to an ACIP RV insurance specialist about your RV insurance needs today. 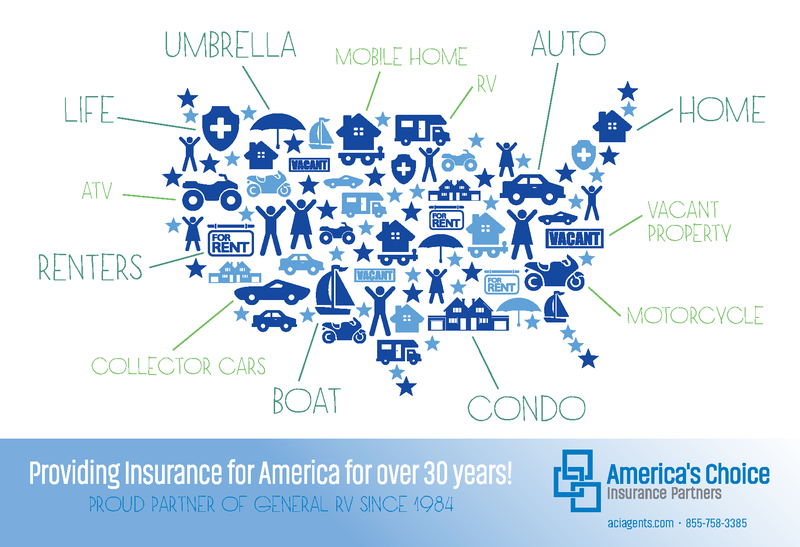 RVers can get peace of mind with an umbrella insurance policy from America’s Choice Insurance Partners. Umbrella coverage protects you (the RV owner) from liability in circumstances like major claims or lawsuits from others involved in an accident. An Umbrella policy provides additional coverage above and beyond what your current RV policy has so you can be 100% prepared for whatever comes your way.